As I was returning home from a reception Monday night, there was a spectacular light show from some large thunderstorms to the north. The storms were far enough away that the thunder wasn’t audible, and I couldn’t see ground strikes. Instead, the massive clouds were illuminated from within by flickering lightning. Overhead, the sky was clear, with brilliant, sparkling stars. A gloriously beautiful night! We have many negative connotations in our culture surrounding darkness, but the two light shows overhead made me grateful for the loveliness only darkness can reveal. So, this week, I invite you to go into the darkness in your journal. The instructions for this week’s activity are short and sweet: work on a dark surface. Why work on a dark surface? Metallic gel pens, iridescent and duochrome paints, glitter and everything else that sparkles and shines—all of these are set off to best advantage on a dark surface. Working dark-on-dark (e.g. black in over dark grey watercolor, or graphite on black paper,or dark brown ink on brown kraft paper) has a subtle beauty that can suggest a serene spareness or quiet mystery. Working with white or light opaques on a dark surface is dramatic and departure from the usual, and may evoke entirely different moods than the same activity done on a white page. You can use dark ink or acrylic or dark paper to decisively cover over a section of a previous page that you want to transform. Using a dark surface over a portion of a page, or working with a dark page and a facing light page, can be an interesting way to invite a dialogue between two people, ideas, alternatives or personas. And, of course, there are many metaphors, both positive and negative, employing shadows, night, darkness, etc. Working on a dark surface, or with an interplay between dark and light surfaces, can be a wonderful way to explore these metaphors and your attitudes towards “the dark side”, your “shadow” self, the unconscious, night, winter, and so on. Take any of our previous activities (or make up your own) and try it out on a dark surface..
A directed doodle done with metallic gel pens over black ink. Here I did a Directed Doodle using metallic gel pens over black ink. I did this oriented upright, but when I turn it on its side like this I think I see a fish in there! This will probably become a Creative Seed for more work. In this case, I added some black ink and additional drawing and painting over a blind contour drawing to play with a “shadow” theme. Metallic inks over black ink. Here, I drew my design with pencil and then painted in the 4 thicker “petals”with metallic inks. Then I cut a “sepal” shape out of freezer paper and stamped to get the lacy effect, and added a small amount of metallic gel pen to bring out the center and the outer edges. You can see that I taped off the edges of the page once again. I do this partly to have the nice border, but mostly because it keeps the ink from running over the edge onto underlying pages. When I remove the tape, I first heat it with a blow dryer to soften the adhesive and keep from tearing the paper. Black ink added to enhance a “blah” start. In an earlier Creative Seed, I had painted a yellow rectangle surrounded by a pale purple rectangle. It was blah and boring! So, I came back and added a deep gold around the yellow and then black around the gold. Now it glows like a brightly-lit doorway! I left a little white at the top corner because I thought I might decide to add some words—poetry? a favorite quote?—later. More metallic ink on a black surface. 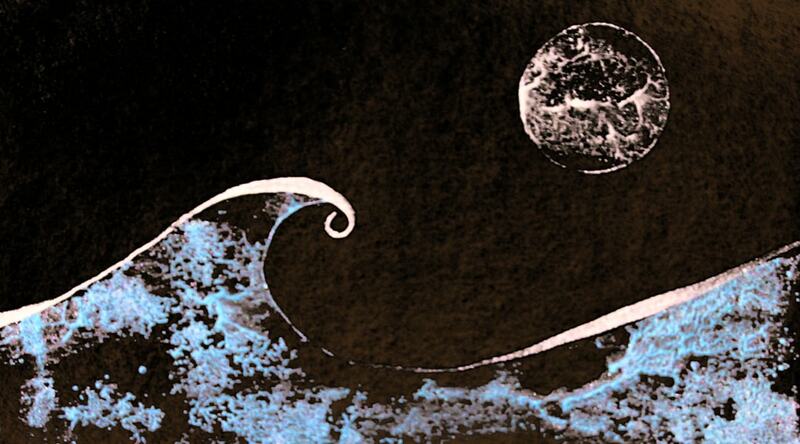 Again, I cut out shapes from freezer paper, painted them with metallic ink and stamped the wave and the moon. Wet ink or paint beads up on the freezer paper, giving the broken, lacy effect. Waxed paper will also work for this, as will regular copy paper. Each leaves a little different texture, depending on how much the paint or ink beads up on the particular surface. Paint a page (or portion of a page) with sumi ink or india ink (both are water-resistant when dry). I like to tape off the borders of my page so that the ink doesn’t run over the edge onto the next page. If you want the entire page to be black, you can also slip a piece of scrap paper under your page to prevent the ink from running down the edge onto the next page. Ink may bleed through some lighter-weight papers, so you might want to avoid doing this on the flip side of a page you particularly love. Use dark watercolor. This will not be waterproof, so some of the color with run if you use a wet brush to add more paint. However, that can be a useful thing. If you like, you can “lift” some of the color off the page by re-wetting an area, letting it sit for a minute and then blotting up the water along with any loose pigment. You can gently scrub the surface with the brush to loosen more pigment, but be sure to blot right away so you don’t push the loosened pigment down into the paper fibers. Use dark acrylic paint. This tends to bleed through less on lightweight papers, because the paint has more body than ink or watercolor. However, be advised that thick applications of acrylic paint can act as a glue and make pages stick together, even after they are dry to the touch. If you paint a solid layer of acrylic in your journal, it’s a good idea to slip a sheet of waxed paper or freezer paper (plastic side against the acrylic) between the painted page and the next journal page until the acrylic paint has fully cured (up to 3 weeks). Glue or tape in a piece of dark paper. If you want to replace an entire page in your journal, you can use a razor blade or X-Acto knife to slice out a page, leaving about a half-inch near the binding to glue or tape your new page onto. I leave it to you to discover how working with darks changes how the work feels, and to ponder all the possible lessons to be gleaned from “working in the dark”.